I50 years ago, on 7 June 1866, the philosopher and member of parliament John Stuart Mill presented a petition to the British parliament asking for women to be included in a new Reform Bill, which, as it stood, extended the right to vote, but only to ‘male persons’. Nineteen-year-old Millicent Garrett was one of a group of female persons who had collected signatures on the petition. But the men in parliament were having none of it. It would be more than 60 years before Millicent, later known as Millicent Garrett Fawcett, would sit in the public gallery of the House of Lords watching the final stages of the legislation that would allow women to vote on the same basis as men. 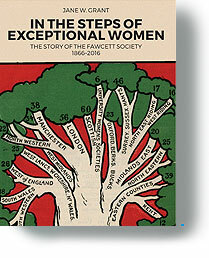 Jane W. Grant’s book traces the long and continuing struggle for equality, focusing particularly on the role played by Millicent Garrett Fawcett in various feminist organizations, including the one which still bears her name. Author of a doctoral thesis on The Governance of Women’s Organizations, Jane W. Grant, who is a friend of mine, pays close attention to the day-to-day practicalities of feminist campaigning, from the Victorian era to the present day. She shows what many radical organizations have discovered, sometimes to their cost – that just because you are against the establishment, it doesn’t mean you can afford not to know how the establishment works. To be an effective pressure group you don’t just have to be right; it also helps to have money, a roof over your head, friends in high places and someone in the office who understands about tax and trusts and charitable status and cataloguing systems. The book is at its most interesting when it explores these nuts-and-bolts issues and how they have developed down the years. There are fascinating accounts of the difficulties faced by women’s organizations finding and keeping suitable offices, as well as the troubled and complicated history of the Fawcett Library, now the Women’s Library, housed at the London School of Economics. Grant has researched these matters in painstaking detail, often using skills that are both scholarly and journalistic. At times I wished the book could have been longer, so that half-told tales could have been completed. We’re told that in 1914 Millicent Fawcett ‘received a threatening letter from Lord Robert Cecil’ but if we want to know what it said we have to look it up in someone else’s book. We learn that in 1954 Sylvia Pankhurst demanded that a passage be altered in Ray Strachey’s The Cause, but not what the passage was, what was at issue or how the matter was resolved. We learn that some women in the 1980s found the walk to the Fawcett Society’s Harleyford Road office in Kennington, south London, ‘intimidating’, but not what frightened them or what that meant for women who actually lived in Harleyford Road. And why mention the allegations in the tabloid press in 2014 that the Fawcett Society’s ‘This is What a Feminist Looks Like’ T-shirts were sourced from sweatshops – allegations which the Fawcett Society denied – if the story’s only significance is the ‘bad publicity’ it caused? As well as containing fascinating and enlightening accounts of events and episodes from women’s all-too-frequently lost history, this book also presents a fine and evocative collection of photographs.